Only one new book this week. My mail carrier could use a break and maybe I’ll get caught up on a few books. Between gardening, spring cleaning and my latest project – cleaning and re-sealing our large deck – I should get in a lot of audio time. I just need a few warm days with no rain. 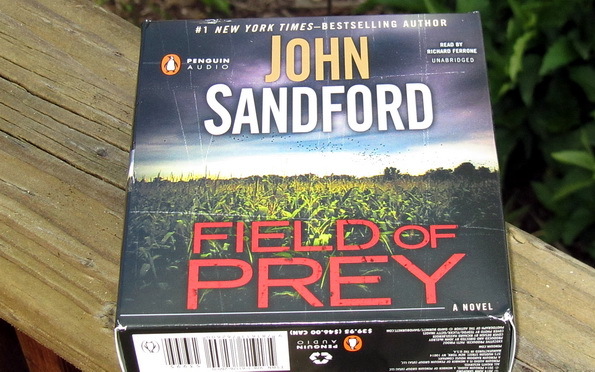 Field of Prey by John Sandford from Random House Audio. The night after the fourth of July, Layton Carlson Jr., of Red Wing, Minnesota, finally got lucky. And unlucky. He’d picked the perfect spot to lose his virginity to his girlfriend, an abandoned farmyard in the middle of cornfields: nice, private, and quiet. The only problem was . . . something smelled bad — like, really bad. He mentioned it to a county deputy he knew, and when the cop took a look, he found a body stuffed down a cistern. And then another, and another. To celebrate the paperback release of Ladies Night by Mary Kay Andrews, I have a fantastic prize package, courtesy of the publisher and Tandem Literary, to giveaway to one lucky reader. To enter, fill out the form. US addresses only by midnight 5/24. Hope you enjoy the Sandford audio! One book is always good in a way – you can catch up! Enjoy the warm weather, as it cools here, my gardening time is less and less. Looks like a good audiobook for a long trip! Enjoy! I’ve been doing a lot of listening lately too. Hope you enjoy your new audiobook and spring projects! Enjoy your projects…and getting caught up on all your books! Enjoy your listening and projects, Leslie! 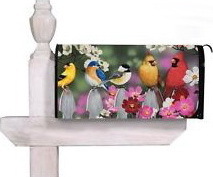 good luck to all who enter, I on the other hand can’t listen in this warmer weather, lawnmowers and such going on. Just one new arrival. I love that! I need fewer arrivals still. I’m trying to read some of my tbr and I manage a few books per month. I can’t wait to see what you think of the audio version! Audios are definitely great when projects are going on. ENJOY your reading week, and I hope all your projects get completed. I’ve only read a couple of them but I like them enough to (someday) go back and read the earlier ones. I first found Sanford through his Kidd series (the computer hackers), but he only wrote four of those and then stopped. Kidd showed up in one of the recent Lucas books. I liked him! If you remember which one it was, let me know! The Kidd series is really dated now – the cutting edge computer equipment they used is soooo obsolete today – but I still recommend them as a fun, fast read.